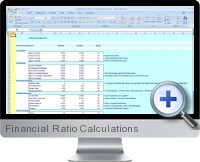 Financial Ratio Calculations for Excel provide calculations for 2 period and 5 period analysis. Financial Ratio Calculations calculates over forty financial ratios from two and five period balance sheet figures, income statements and cash flows. Financial ratios include: profit ratios, return on total assets, return on equity, return on invested capital, working capital, working capital days, asset ratios, inventory, payables and receivables ratios, acid test, quick ratio, debt ratios, solvency ratios and cash flow ratios. All ratio formulas are given. Financial Ratio Calculations also provides additional efficiency and shareholder return ratios: Operating Cycle & DuPont Ratios. Operating Ratios are a measure of management's ability to turn the cash cycle from inputs to money in the bank. Core Financial Ratios – Dupont Ratios – Operating Efficiency Ratios now computed and summarized in a separate table. DuPont Ratios are a short cut to examining core ratios which make up the return on equity. These are considered the most important ratios as they compute shareholders return. Financial Ratio Calculations for Excel supplies ready made balance sheet and income templates for quick entry of results or forecasts for 2 periods.